The name Severn comes from the British river separating England and Wales, and early settlers gave that name to our Severn and also to a tidal river in the lower Chesapeake off Mobjack Bay in Virginia. Our Severn is a tidal tributary of the Chesapeake Bay, extending from Annapolis northwestward about 10 miles. Above this, Severn Run provides the main source of fresh water to the tidal river. More than a dozen tidal creeks join the Severn throughout its length, allowing sheltered anchorage for many recreational boats. 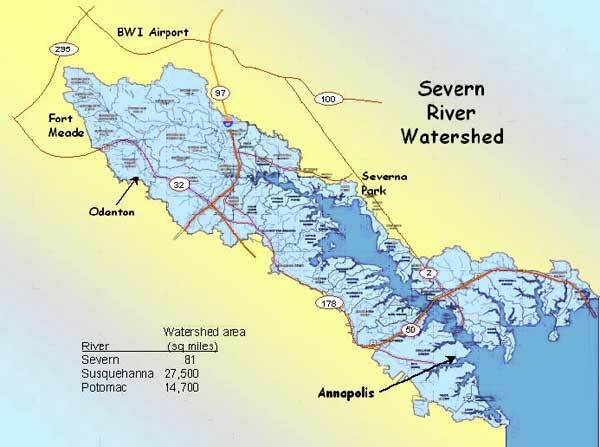 The map above shows the Severn watershed, which is much larger than the tidal Severn, but is dwarfed by the watershed areas of the largest rivers supplying the Chesapeake. The depth in the middle of the Severn is typically about 20-25 feet, down to about 10 feet in the creeks. This depth prevents large ships from coming into Annapolis, and was one of the factors that fostered the growth of Baltimore at the beginning of the 19th century. An estuary is defined as a semi-enclosed water body with openings to the sea and a source of fresh water, and the Chesapeake is one of the world’s largest estuaries. Fresh water and sea water mix in interesting ways in estuaries, and the Severn’s salinity reflects a balance between fresh water coming down the Chesapeake from the Susquehanna, and denser sea water coming up the Bay from the ocean. Since the Severn is roughly one fifth of the way down the Chesapeake from the Susquehanna, it is reasonable that its salinity is roughly one fifth of sea water (which is about 35 parts per thousand salt). The graph below shows the Severn’s salinity as measured at the Route 50 bridge by the Maryland Department of Natural Resources. It can be seen that the salinity varies throughout the year, with the freshest water in the spring and the saltiest water in the fall. The Severn Riverkeeper monitoring projects have shown that at any time, the salinity is quite constant throughout most of the Severn, from Annapolis until above Round Bay. There the fresh water inflow from Severn Run can be detected as a decrease in salinity after rainstorms. Thus it is misleading to think of the Severn as a river. It is actually an elongated bay off the Chesapeake, with a subestuary at its northern end. Further details on the Severn’s salinity can be found in the reports of the Severn Riverkeeper Monitoring Projects. The Severn’s intermediate salinity limits the biological organisms that can live in it, as it is too salty for most fresh water fish and too fresh for most marine organisms. However, some animals are adapted to this level of estuarine salinity, including blue crabs, oysters, white perch, eels, and a variety of other fish as well as invertebrates. Yellow perch, traditionally targeted by recreational fishermen in the Severn, are no longer common. Oyster harvesting has been banned in the Severn for many years because of public health concerns, but natural reproduction at this low salinity is limited, and active restoration of oyster reefs is underway. In the shallow waters near the shore, submerged aquatic vegetation (SAV) has traditionally flourished in the Severn, providing excellent habitat for crabs and fish. Several different SAV species formerly grew along all the shores of the Severn, but died off completely throughout the 1980s. However, starting in the 1990s, SAV in the Round Bay area has grown back, and the Severn now has the largest and densest SAV beds in the mid-Chesapeake. However, SAV has not grown back in the upper and most of lower Severn. The Severn is a major recreational resource for the area. Boating activities include casual canoeing and kayaking, waterskiing and “tubing” behind powerboats, organized sailboat racing, and mooring boats of all kinds at the many community and private piers. In the summer, swimming is popular at numerous community beaches. Many recreational and some professional fishermen catch striped bass, white perch, chain pickerel, and blue crabs from its waters. A public park offers shore- and pier-based fishing and crabbing opportunities. Dozens of ospreys (pictured at right) and several bald eagles nest on navigation marks and trees along the Severn’s shores. Annapolis harbor is a major center for recreational boating in the Chesapeake, and its town dock is a major tourist attraction, drawing in land-based visitors from far and wide. The Severn is one of Maryland's designated Scenic Rivers, and tour boats regularly take Annapolis visitors up the Severn and out onto the adjacent Chesapeake Bay. The Severn’s water quality has been a concern for some years. In common with much of the Chesapeake, during the summer the levels of dissolved oxygen diminish with depth, to the point where many fish avoid the low-oxygen “hypoxic” waters that occur about half-way between the surface and the bottom. These low oxygen conditions result from eutrophication, the process driven by an excess of nitrogen- and phosphorous-based nutrients that foster the growth of phytoplankton. After these microscopic plants grow in the water, they die off and sink to the bottom. The dead phytoplankton are utilized by decay bacteria whose growth, in turn, consumes oxygen from the local water. Because vertical water circulation is normally restricted in estuaries, oxygen-depleted water near the bottom is not replenished by oxygen-rich water near the surface. Such a dead zone forms each summer in the deep waters of the Chesapeake, and the Severn Riverkeeper Monitoring Project has found a unique dead zone in the upper Round Bay region of the Severn. This is the only documented example of a persistent summer dead zone in such shallow (~20 foot depth) water in a Chesapeake tributary. The consequence of this is that a significant percentage of the Severn has no living bottom-dwelling organisms that form a critical part of the food chain for crabs and fish. This dead zone, combined with the more general hypoxia throughout the Severn, leave no doubt that lack of oxygen clearly limits marine life in the Severn.